All your searches made from this system integrated on our website are redirected to our partner ‘Aéroports-Voyages’. 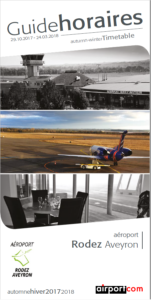 Book and receive by email the last important information from Rodez airport before your departure! The airport also gives you the possibility to book your flights directly at the check-in counter. Please find opposite, the timetable with all the useful information of this season!